One of the most frequently asked questions we have been receiving lately is, "Which blender is best the Champ HP3 or the Vitamix?" It depends on your definition of best. If your sole criteria is SHEER horsepower, the Champ HP3 wins. The Champ HP3 with its 3 peak horsepower rating, over powers the Vitamix with its 2 peak horsepower rating. Many people ask, "how is the The Champ HP3 so powerful when its so light?" and "the Vitamix is so heavy, and big, it must have a more powerful motor?" Well remember, bigger isn't always better. 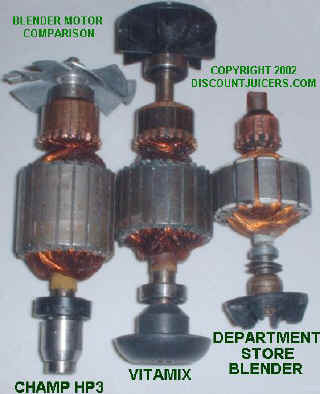 DiscountJuicers.com has taken pictures of the inside of the motors of the two units, as well as a picture of the "department store blender" that many people own. See for yourself which is more powerful. Blenders are based on a motor, which uses magnets to create motion. As you can see from the picture on the right, the Champ HP3 armature has more copper windings than the vitamix armature, which basically means a stronger magnet, which means a more powerful motor. In addition you can see the metal fan on the motor on the Champ HP3r, where the vitamix has a plastic fan. At the factory, each Champ HP3 motor fan is balanced, much like balancing a tire on a car, the metal can be bent/shaved to ensure its balanced, which is really important for these high speed blenders. The vitamix has a plastic fan, and I'm not sure if they balance it at all, I do know that vitamix does weigh the base of the blender, to possibly help offset any imbalance. From the picture above, you can see the motor of a "350-400 watt" household blender, which literally looks like a "toy" compared to the Champ HP3 and Vitamix blender motors. Which ever blender you choose, the "best" blender is one that will best meet your individual needs. Take a look at the blender comparison chart for a detailed comparison of the two units. The blender you choose should best meet your needs, and each person's needs are different... If you want the blender with the most powerful motor, the Champ HP3 Blender would be the best choice. I really like how its more convenient to scoop out the ingredients out of the Champ HP3 blender, since it has a wider and square carafe. Another benefit is that it fits under standard household cabinets, as a machine that's left out, will get used more often than a machine that must be taken out to be used.